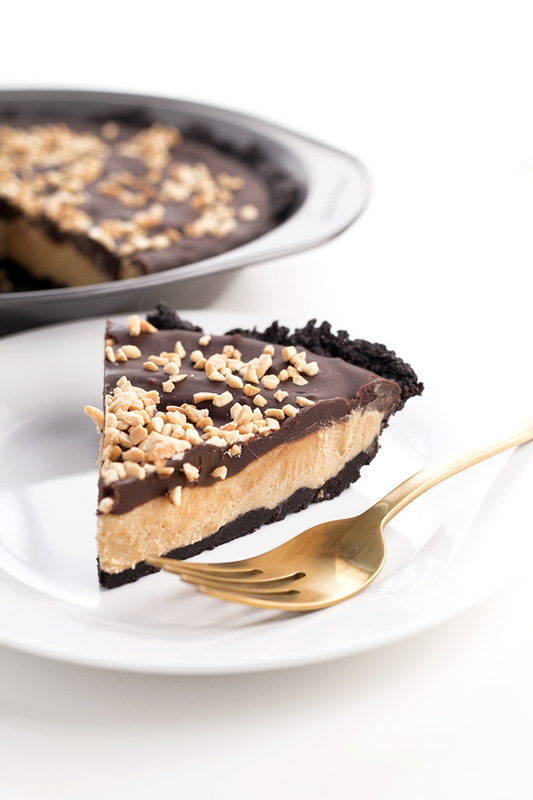 The recipe for this Peanut Butter Pie couldn’t be any simpler to make. As I always say, even a hamster could make this with its tiny eyes closed. We start off with a simple, no cook Oreo crust. Oreos… always a good start to anything in life, really. After our Oreo crust comes a luscious Peanut Butter Mousse filling that is made with Peanut Butter, Vegan Butter, Sugar, Coconut Cream and Vanilla. Health food hippies, the time has come again for you to pretend you never saw this post. Leave a comment about how this pie is “vegan but unhealthy” and I will cut you. Okay, so this Peanut Butter Pie is starting to come together. Now we crown this baby off with a silky Peanut Butter Chocolate Ganache which only requires 3 ingredients – Peanut Butter, Vegan Dark Chocolate and Coconut Cream. Winner. So ladies, gentlemen and hermaphrodites, there you have it. 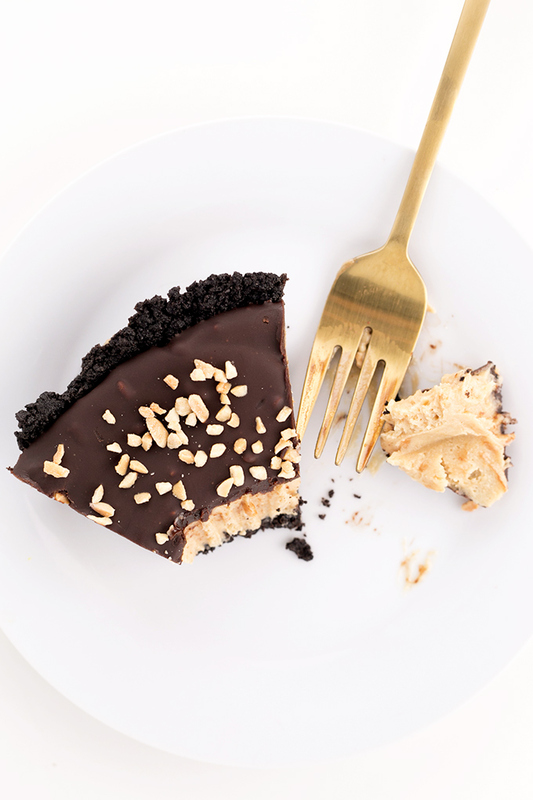 A giant a$$ Vegan Oreo Peanut Butter Pie. 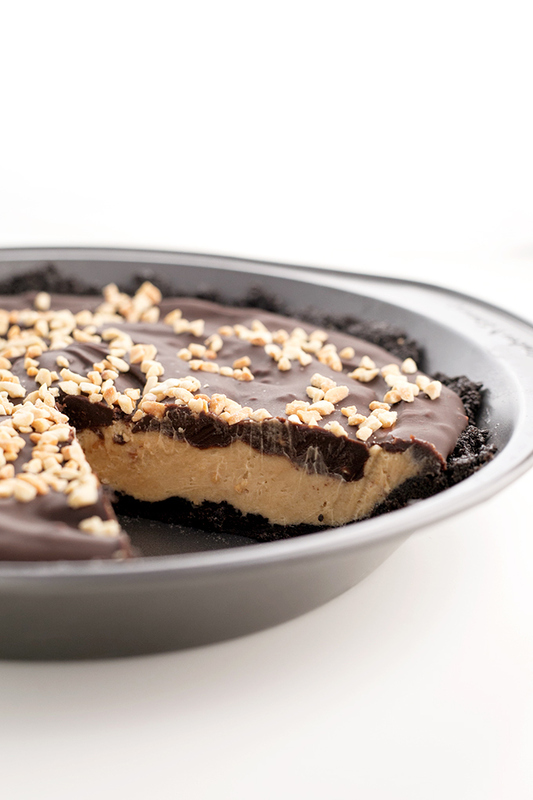 It’s like a massive Peanut Butter Cup, but better. A big pie gives you a big bum. But that bum will also be full of lovely peanut buttery goodness. Promise. As always, scroll down for the entire recipe. 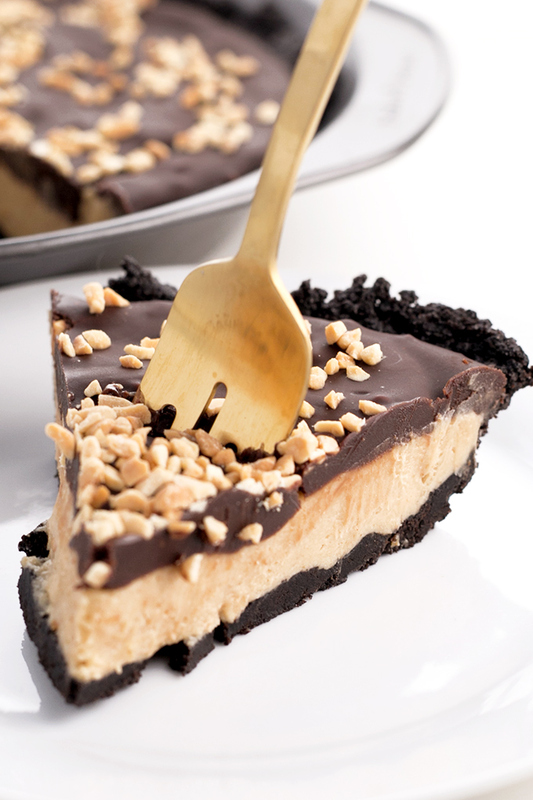 Make this Vegan Oreo Peanut Butter Pie. Have it for Christmas, have it for the New Year, have it for whenever the f*ck you feel like having pie. Ciao x.
Oreo crust, Peanut Butter Mousse filling and Chocolate Ganache Topping. Done deal. Make your Oreo Crust by blitzing the cookies in a food processor until they form fine crumbs. Pour in melted Vegan Butter and blitz till fully incorporated. Press crust into pie tin and freeze for 10 minutes whilst making filling. To make your filling, combine all the ingredients for the Peanut Butter Mousse in a bowl and whip with an electric mixer till light and fluffy. Pour mixture into frozen crust and spread out evenly. Freeze entire pie tin for an hour. 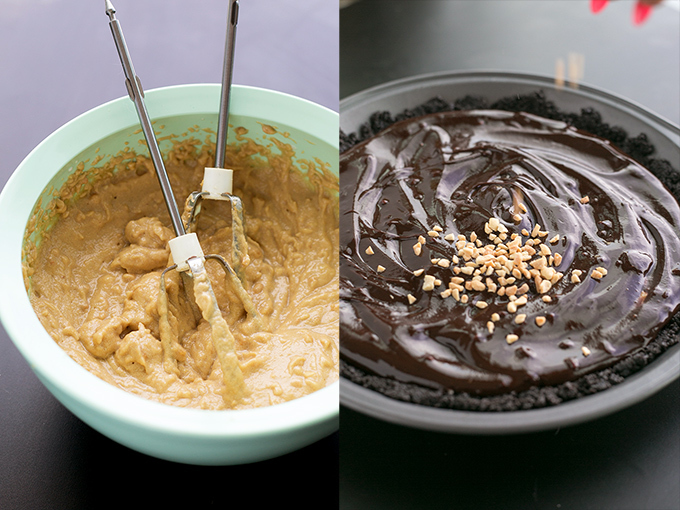 Before taking your pie out of the freezer, prepare PB Chocolate Ganache. Chop chocolate and transfer to a bowl along with Peanut Butter. Heat Coconut Cream in a small saucepan till it simmers and then pour over chocolate/pb immediately. 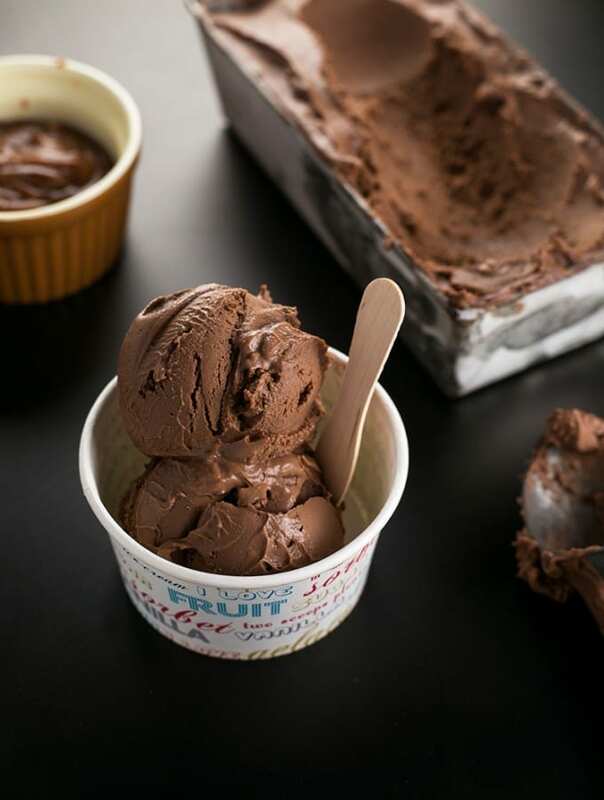 Stir till you have a smooth and glossy ganache. Add Peanut Oil into ganache and stir till fully incorporated. Pour ganache over set pie and spread/smoothen out. 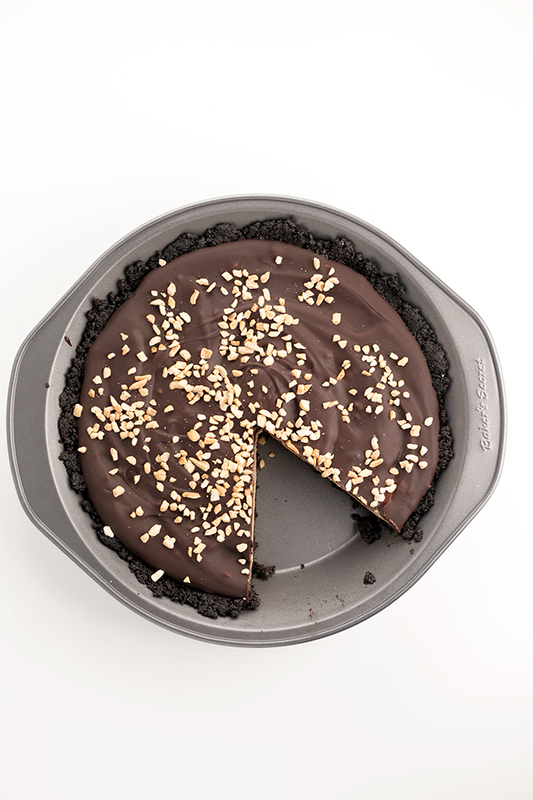 Sprinkle chopped or crushed peanuts on the surface of the ganache and leave pie in the fridge for an hour for ganache to set. Coconut Cream in this recipe doesn't need to be chilled prior to prep. I hope you all enjoyed the pie, Abby! OMG - that's sounds sooo delicous, gonna have to try it! Hi I’m making this for my dads birthday we’re not vegan but he is diabetic and dairy free which is why I picked your recipe. I substituted the super fine sugar for stevia in the raw sugar substitute will it work? Hi Em, that most definitely will work! You'll have to experiment with quantities, however, as I know Stevia doesn't measure the same as sugar unless you get a specific variety! Hi! Have this in the freezer now and just wondering, is fine sugar regular sugar or powdered sugar? I’m afraid my mousse is all grainy!!! Hi, I’ve just finished making this but am now kicking myself as I’ve just realised I forgot to put the oil in the ganache.. will this make a big difference? Hoping it’ll still be good..
Hannah, don’t worry! The ganache May be a slight bit thicker than mine was but it will taste all the same!! Hope t goes well for you! Great, thanks so much. Just ate it this eve with family and was delicious! Does this recipe work well with natural peanut butter or do you suggest a specific brand. Also, instead of peanut oil can I use coconut oil? I don't have it on hand and would like to avoid buying it for such a small amount . Thank you in advance! So...turned out beautiful :) it's sooooo good, thank you. Was worried when the mousse wasn't looking like a mousse but I went with it and perfection. This and your tarimisu are the best desserts Ive ever made - and I bake ALOT! Thanks again! Terri, thank you so much for that kickass comment, it made me smile. So happy you enjoyed both the recipes! Made this for an office party and loved it!!!! I actually find that the texture is best when served directly out of the freezer. It gets a little runny if you're just storing it in the fridge. But of course it just depends on how you like it! Hello Kim! Thank you so much for the fantastic review. So glad they enjoyed it! Does it have to be crunchy peanut butter? And how many cans of coconut cream should I pick up? Hahahahaha! I've had enough practice from high school when people were mean to me! Thank you for dropping by, do let me know if you ever try the recipe out - it's one of my friends faves! Hi there, I'd really like to make this for my boyfriend's birthday next week, but I don't have an electric mixer. Is it possible to use a blender instead or will it take away from the fluffiness? Definitely :) They'd be super cute as well! We just had it tonight and ii is phenomenal! No overwhelming coconut taste. It is smooth, creamy, and you can taste the peanut butter in your he filling. The chocolate top is to die for! We topped it off with coconut vegan whipped topping! I can't say enough about how good it was! Thank you- this recipe looks OUTSTANDING! Maybe for myself at home I might be interested in one of the health nut versions, but if you want to show that vegan can be as decadent as dairy, then THIS is the ticket! Thank you Gwen!! 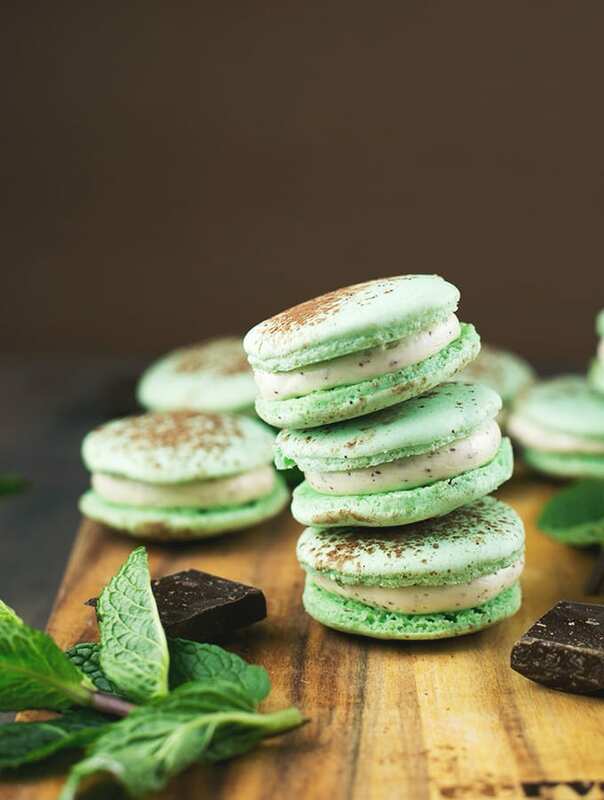 I usually use these more indulgent recipes to get the carnivores over to the dark side where we have vegan cookies! I find its the best way to let them know we don't just eat grass and that a vegan lifestyle isn't hard to maintain! Would semi sweet chocolate chips work for this? Instead of vegan dark chocolate? Do I leave the filling in the Oreo? How long will this pie keep in the fridge if made ahead? Could the crust and filling hang out in the freezer a couple of days? Hey PJ, it'll do just fine hanging out in the fridge for a few days :) no need to freeze! Thank you! I thought was going to be the case :) I went to three grocery stores, but I finally found what I need. If this tastes half as good as it looks, then it's a good thing I now know which grocery store to go to for my supplies! My sister in law is vegan, and we are surprising her with a totally vegan thanksgiving this year!! Can't wait to enjoy! I finally got round to making this and it was awesome! Made it for my mums birthday and she absolutely loved it and so did all the other non vegans at the dinner party. Hey, this pie looks lovely. Just one question could u use honey instead of the sugar? Hey Sara, I suppose you could, but they may differ in quantity as honey is generally sweeter than sugar. Do try and let me know! Made this pie tonight for my bf and he loved it!! I used Pamela's GF chocolate graham crackers for the crust! It was decadent and delicious a naughty treat to celebrate his bday! Thanks so much Megan!!! This one is the one that my Omni friends absolutely love too - sneaky!!! 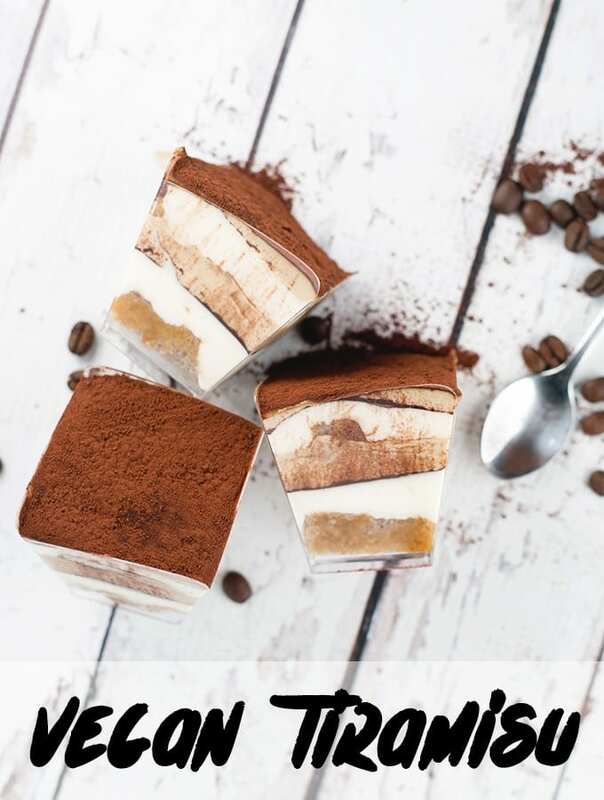 I'm working on a Coffee Ice Cream Pie soon, once I recover from this crazy illness I've been suffering from for the past month. Stay tuned! This pie is sooo good! Easy and quick to make too! It took me 10 mins to whip it together. I had to make it gluten free for my son, used gf animal crackers I had the pantry and they worked out just fine. He said it was "bomb"! 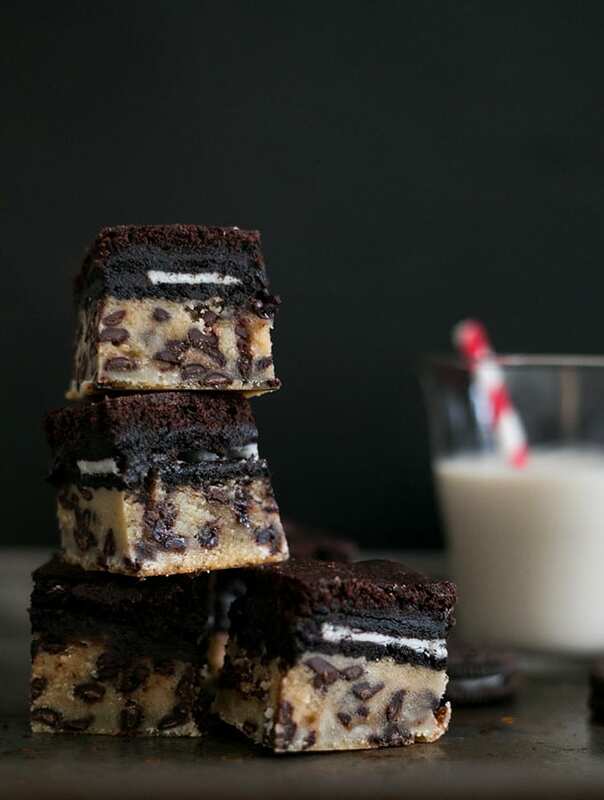 Chocolate, peanut butter and Oreos, could it get any better?! This sounds amazing! Yo, awesome recipie, and personally I'm a fan of your comment crowd control :D. I'm hoping to make this for some bands I'm catering for atm. Could I substitute soy yoghurt for the coconut cream, or is the coconut kind of making the filling 'set'? Can't wait to try this out! Can you substitute the peanut oil with regular vegetable oil? Thanks! So glad to know!!! Thanks for the feedback! i figured youd all say they are vegan.... BUT, this is from the Oreo website....White and milk chocolate covered Oreo biscuits are not suitable for vegetarians. Oreo is not suitable for Vegans as they have the cross contact of Milk. Sorry, the Oreo recipe contains wheat so Oreo is not suitable for a gluten-free diet. Oreo does not contain nuts or any traces of nuts. FAQ - Oreo www.oreo.co.uk/faq not vegan! or healthy. lol. i cant wait till all the sheep are dead. REGULAR Oreos in Australia are Vegan - I do not use the chocolate covered ones you stupid donut. Use something else if you are in a country where they are not Vegan. Also, never said the recipe was healthy OR GLUTEN FREE - pretty sure I made it clear that it'll expand your arse by ten fold if you eat too much. http://www.gofuckyourself.com/faq you're lame! and not worth my time. lol. i can't wait till you are dead. I found this site through finding vegan.good recipe but I'm really turned off by your bad attitude. It seems you have a personality disorder and poor impulse control for someone trying to make a brand for themselves online. Thanks Doctor, but I'm not keen on "branding" myself as anyone else but me. Ciao bella. Isn't it better for more people to want to try the vegan lifestyle and embrace the beliefs? It's people like you that give vegans a bad name for being judgemental and stuck up. If people see other vegans shaming people for "not being vegan enough" they will be turned off by the whole thing and not want to try it. I thought the whole goal was to encourage as many people as possible to use less animal products to reduce the amount of animal suffering in the world and reduce the environmental impact animal agriculture has. It's so frustrating when people turn it into a competition instead on whose the better vegan. That's not the point. We should be working together to raise awareness and encourage others to embrace the lifestyle instead of tearing other vegans and their websites down because they aren't vegan enough. It's ridiculous and this is the type of thing that deters people from veganism. If you truly cared about the vegan cause you would spend less time criticizing people for not being "good enough vegans" and spend more time advocating, educating, and ENCOURAGING others to embrace veganism in their own lives. There will always be that one person offended by everything! With me? Lol. Nothing, but what is wrong with the people who come here to troll, get a funny response from me and then run away and don't seem to retaliate? Planning on doing this recipe with my gf for Christmas. Wanted to ask, for the oreo crust, you're supposed to use the oreos without their filling, right? Hi, thanks for sharing this recipe! It looks amazing. Could I use margarine instead of vegan butter? I don't think they sell vegan butter in my area, unfortunately. Cheers! Hey Nel. Aussie Oreos are definitely vegan. If they aren't in your country, try Newman O's sandwich cookies :-) and as for ads, I try my best to filter out irrelevant ones but they slip through from time to time, so there's not much I can do about it lol. I always know that when I click on your posts.......it's gonna be a fun read and a great recipe! I can't wait to try this pie and amaze my non-vegan (but supportive & moving towards a more veggie centered life each day)) family!! You are awesome! 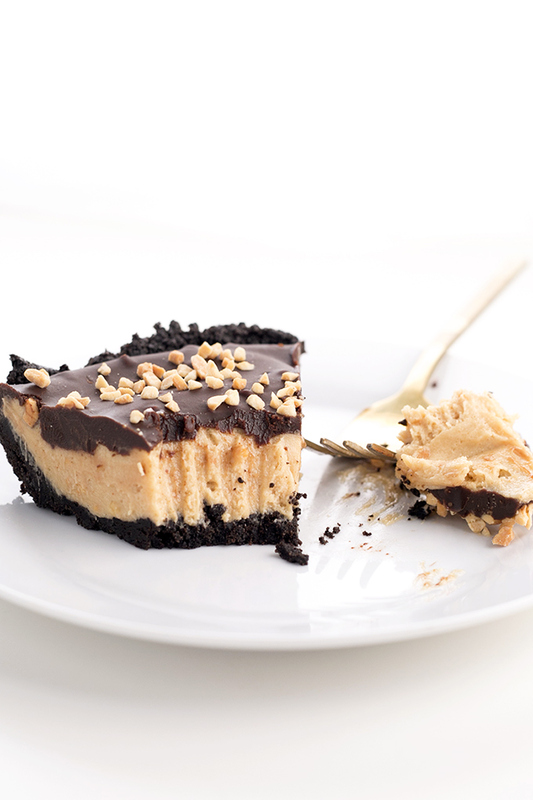 Ummmm this peanut butter pie is basically the best thing I have seen all day. I could probably eat this whole pie without sharing. I mean I know the holidays are for sharing but it's a peanut butter pie and it's just too delicious to share. This sounds amazing! Do you know if it can be made a day in advance? Definitely! It's good for up to 3-4 days in the fridge if it lasts that long! I've been looking for a recipe like this for ages! Thanks. I do have one question - by 'fine sugar' do you mean caster sugar or icing sugar? Mesmerized by the gold fork! Love that photo. Your recipe sounds delicious and looks even better! To die for! I'm not usually a pie person, but this is the one for me. Pinned! Hello, when you say coconut cream, do you mean a can if coconut milk? Hey there, it's coconut cream, different from coconut milk. You can find just coconut cream in a tin at most supermarkets or definitely at an Asian Grocer. Otherwise, chill a tin of coconut milk overnight, open it, scoop the solidified mass that forms on top and let it thaw out - this is coconut cream!